More than 3 million visitors a year travel this road. This guide will show the highlights and mark the mileposts. Big Sur Lodge is in Pfeiffer Big Sur State Park. Driving to the Lodge from the north, it’s 26 miles south of Rio Road in Carmel. Rio Road is the last traffic light on Highway One going south. To the right is the road to the Carmel Mission and to the left are Carmel Crossroads, Carmel Rancho and The Barnyard. 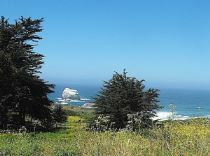 Driving from the south, the Lodge is 64 miles north of San Simeon, near the Hearst Castle entrance. 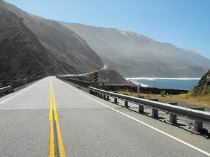 Or, driving to the Lodge from the east, it’s 65 miles from King City via Jolon and the winding Nacimiento-Ferguson Road to Coast Highway One, then north to Big Sur. The last traffic light going south. Set your odometer here. 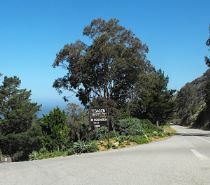 Big Sur Lodge is 26 miles south of Rio Road. In the Crossroads Shopping Center are a major drug store, two chain grocery stores, a natural foods store and many speciality retail stores. 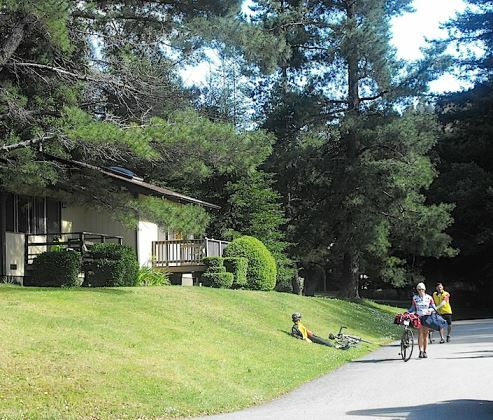 (The Lodge has an excellent general store with picnic and backpacking equipment). Point Lobos State Reserve. California’s state park system was conceived here. Point Lobos State Reserve opens at 9:00 a.m. daily. The Reserve is open until 1/2 hour after sunset. 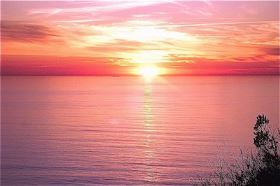 Sunset time will be posted daily at the Entrance Station. $8 fee per car, $4 per car for seniors, $3 per car for disabled, and entrance is free with pass for Lodge guests. Going south, this is the last gas station and convenience store, Carmel General Store, before Big Sur River Valley – 20 miles further. Always nice people and good coffee. Two dogs, generally one at a time. One, Causie, is very friendly. The other, Casey, is a bit aloof. Excellent selections of local wines. Trails begin near here. Print it and take on the trails. No signs. Several trails at road turnouts. 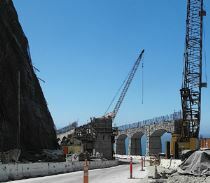 Bridges for Garrapata and Granite Creeks. It’s not easy to see the trailheads and their occasional signs, but the beach and mountain experiences are exceptional. Famous cliffside restaurant with expansive views of exquisite coast. Driving south, an alternative route is the Old Coast Road, if this road is not wet. It goes inland 10 miles and back to the coast at Molera Beach State Park entrance. 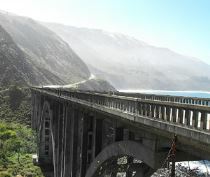 Before the Bixby Bridge in 1932, this was the road to the rest of Big Sur. Scariest section of Highway One along this part of the California Coast. The road is safe in good weather, but always be especially careful. Many tourists are so busy looking at the scenery, they’re not sufficiently conscious of other cars. They may also pull in and out of vista turnouts carelessly. The name “hurricane” comes from the constant winds, often very strong. A dark volcanic cone, marks the most significant break along the whole Big Sur coast. 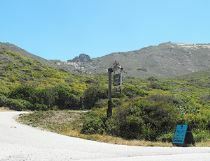 It signifies the northern border of the Big Sur coastal scrub zone. Also, it is home to an historic lighthouse. Magnificent park with awesome vistas. Trails for hikers, mountain bikes and horseback riding. Limited trail use for leashed dogs. Excellent picnic areas by the Big Sur River in the redwoods. Access the PelicanNetwork trail guide. Pfeiffer Redwood Creek trail to the falls is through a lively, dense old redwood grove. It is an instructive trail. You can see how a redwood forest makes its own soil and understory. The creek cuts through alluvial deposits, and you can see how the valley built up over the eons. At the Lodge there is an excellent restaurant, Expresso Bar, Ice Cream Bar, Wine and Beer bar on the River Deck with satellite sports TV. Visitor Center and Multi Agency Facility. 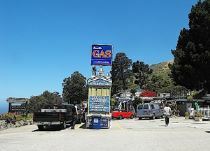 Site of Big Sur Bakery, Spirit Garden and a gas station. 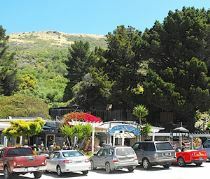 Big Sur Bakery – Excellent, imaginative cuisine in an informal homesteader setting – and a popular morning coffee and pastry house. A timeless wonder. This place sedately evokes all the epocs of Big Sur cultural history. And it is a perch onto the Pacific and Santa Lucia Mountains. It’s a restaurant of rare architectural perfection and ambiance of unprecedented taste. Downstairs is a gift, book, clothes, chime and jewelry shop of quintessential Big Sur flavor. A family of fine and innovative artists in a unique building that is must-see Big Sur experience. Across the road from the southern entrance to Nepenthe. An ensemble of Norweigian barns and cabins, Deetjen’s straddles Castro Canyon in a storybook setting. The restaurant is legendary for its delightful breakfasts. And, now with its chef Domingo Santamaria, it is becoming a dinner house legend amidst a quaint candlelit and wood fire glow. Filled with Big Sur memorabilia and pioneer spirit, Deetjen’s is always a memory in the making. 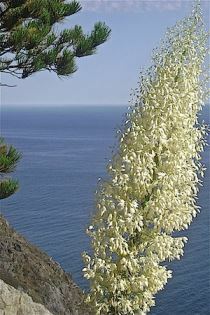 Native yuccas on the Big Sur coast symbolize the extraordinary biodiversity in this mountain range. They luxuriate here in the last outpost of Redwoods. Big Sur sunsets are to live for. 70 foot waterfal into McWay cove is a major Big Sur attraction. Short walk on Overlook Trail is a good leg stretcher. World famous for self improvement retreats and mineral baths. Enlightenment and human potential workshops. Famous for clothing optional hot tubs – which are open to the public in a very restricted window. University of California ecological reserve, Landels-Hill Big Creek Reserve covers off shore kelp beds and extends up two canyons, Big Creek and Devils. This is a research site that is open to the public only one weekend in May each year. Entrance to New Camoldoli Monastery is nearby on the south. Nacimiento-Fergusson Road leads to San Antonio Valley, Fort Hunter Liggett, Mission San Antonio de Padua, US 101 and King City . The Mission has a great museum and exhibits on the grounds of the Salinan Indian era. State Park with intriguing trails in a lovely redwood forest. Beautiful trails into redwood forests – and a magnificent waterfall. 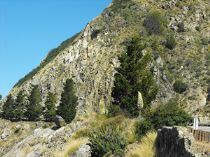 Fascinating kiln history, beach and campground, varrying plant communities from the beach to the alpine reaches of Cone Peak – a sceene of great biological diversity. 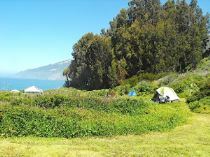 33 tent camping sites – and a few 24 ft and under RV sites on the beach. Trailers ok up to 15 ft. Showers. and Nacimiento-Fergusson Road, the way to the coast from Highway 101. Dramatic coastal setting. 33 unreserved campsites. Fire pits and cooking grills. RVs up to 30 feet ok. Restrooms. 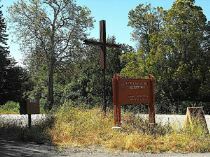 Mission San Antonio de Padua is near Nacimiento Road as an inholding enclave on Fort Hunter-Liggett. Driving in the Army base requires vehicle registration and insurance. Vicente Flat Trail trailhead across the road from Kirk Creek Campground. Trail Heads into Los Padres National Forest and Ventana Wilderness. 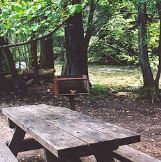 Mill Creek – Forest Service picnic area. Great ocean setting. Picnic tables, cooking grills. Open 10 am to 6 pm. Vault toilets. John Steinbeck’s mother taught at the school here. Longest accessible sandy beach on Big Sur Coast. Grassy meadow, ocean bluffs, trails. Pets ok on leash. Day use fee. Plaskett Rock separates Sand Dollar Beach from Jade Cove. Half mile south of Sand Dollar Beach. 2.2 miles south of Sand Dollar Beach. Day use picnic area. Quaint store and lodging complex. Very expensive gas station. Look for the great white rock blocks in the sea close to shore. The white comes from eons of guano. Entrance to Hearst Castle. Good State Park historical center. Bed and Breakfast Inn and historic Hearst pier in State Park on West side of highway. The real thrill is on the beach with 12,000 + elephant seals mating and birthing. Best in winter months. 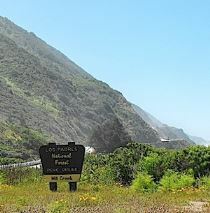 Along Highway One you will see three signs for the Pfeiffer Big Sur State Park on your right. The middle one has the Big Sur Lodge sign. That is the entrance to the Park. Drive in and bear right passing the sign “For Lodge Guests,” so you don’t check in with the rangers at the entrance kiosk. Park at the Lodge (the building where you will find the lobby, store, gift shop, and restaurant), and go to the front desk. There you will get directions to your cottage. Check-in time is 4 p.m., but you can arrive early. The desk staff will get you set up for whatever time you and they agree to get you into your cottage. 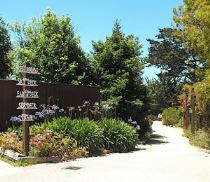 When you first arrive at the front desk, the staff will give you a pass to Pfeiffer Big Sur State Park (where the Lodge is) which also allows admission and parking at Julia Pfeiffer Burns State Park, Point Lobos State Reserve and Limekiln State Park. 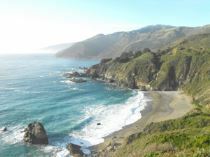 If you are early, you may want to begin to enjoy some real genuine Big Sur experiences. Very near the Lodge is a very good Interpretative Center of local natural history. At the Pfeiffer Big SurState Park, there are several great trails. The one to the Pfeiffer Falls is enchanting, and moderate and very gratifying, through some very old redwoods. The Restaurant at the Lodge is very pleasant. Pfeiffer Big Sur State Park trail maps are available in the shop at the Lodge. 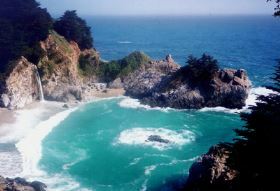 Take a 15 minute drive 11 miles south to Julia Pfeiffer Burns State Park. 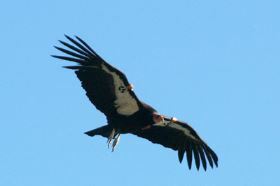 You may see condors on the way to the park. 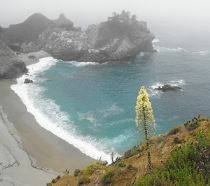 • Make a pleasant one-quarter mile walk to the McWay Falls overlook. A rare and spectacular sight. 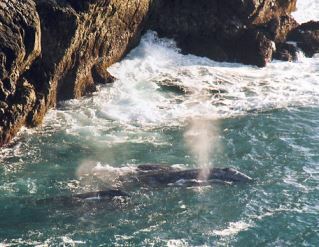 Some visitors have even seen gray whales in the cove. Family of migrating California Gray Whales seeks refuge in McWay Cove from predatory Orcas. 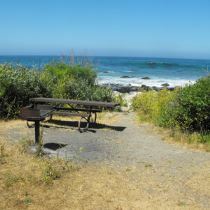 • For some exquisite coastal views, hike over to the South Gardens environmental campsites, south of the Falls trail. 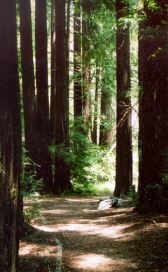 • To see a truly magical redwood forest, canyon and creek scene, go into the park’s picnic ground. There is a short hike into the canyon to another waterfall. These three little treks are brief in distance, but monumental in beauty. 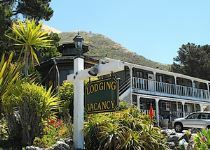 Deetjen’s is 30 miles south of Carmel and just 4 miles south of Pfeiffer Big Sur and your Lodge. Deetjen’s is a very quaint pioneer scene in a picturesque redwood creek canyon with exceptional meals, so it’s a must to make reservations – call (831) 667-2378. The Phoenix has a good book selection, many interesting stoneware and other products . A patio at Nepenthe above the shop has an invigorating view that is powerfully “Big Sur” and hosts a good place for refreshments. 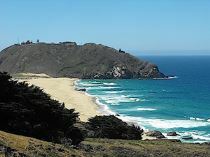 This is just three miles south of Pfeiffer Big Sur State Park and your lodge. This Big Sur destination is tucked behind a wooden fence at Anderson Creek Canyon in a redwood grove on the east side of road at about 30 miles south of Carmel. 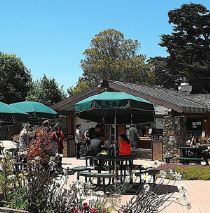 It is a little less than 4 miles south of Pfeiffer Big Sur State Park and Big Sur Lodge. It is an idyllic setting for a library, but it is more of a bookstore and community center. Henry Miller Library champions the works of the great American author, artist and Big Sur resident. This non-profit organization features an art gallery with a treasure of fine books, art and history of the area. Many items, including rare books, are for sale. Open Thursday – Sunday 11 am – 6pm. In summertime, open every day except Tuesdays. Available for special events. (831) 667-2574. Pfeiffer Beach is always extraordinary, but sometimes windy. Driving 1.1 miles south of the Lodge, make a sharp right turn (only the second one from the Lodge and State Park) at the sign for “Narrow Road” “No Motor Homes or RVs.” That is the unmarked Sycamore Canyon Road. Please heed this, the road is narrow and windy. Drive 2.1 miles to the Beach. Parking fee is $5. North of the Park and the Village, is Molera Beach State Park. 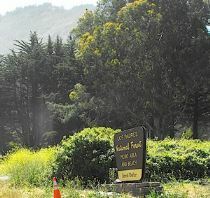 It is 21.5 miles south of Carmel and four miles north of Pfeiffer Big Sur State Park and your Lodge. You will find a nature interpretive center operated by the Ventana Wilderness Society (who manage the condor releases), a riding stable for renting horseback rides, the park’s historical museum at the old ranch house, and many miles of great hiking trails. One trail is down to the beach and lagoon of the mouth of the Big Sur River, another is up the bluff along the south side of the park with some of the most incredible views ever to be seen. on the Big Sur Coast. A great enhancement for your trip could be a couple of books. We recommend The Natural History of Big Sur by Henson and Usner, University of California Press, and A Wild Coast, and Lonely by Rosalind Sharpe Wall, Wide World Publishing. Coast Gallery, built with redwood water tanks and home to a prominent candlemaker, is host to important artists and is sponsor of a summer artists-in-action-program. Henry Miller was not only a great writer, but a prolific and good artist, as the standing exhibit here will show. Nice gift shop and cafe. 7 miles south of the Lodge. Nepenthe’s Phoenix Shop has many art objects for sale. The Hawthorne Gallery is on the inland side of the southern entrance to Nepenthe. Ventana Spa Inn shows good local interest art, including paintings by Kip Stuart, the architect and designer of furniture for Smith & Hawken. 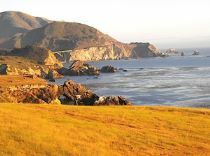 What fascinating and rewarding experiences this state park readily offers in the heart of Big Sur. 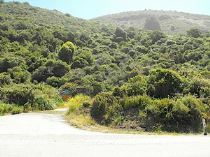 Limekiln State Park is located 36 miles south of Pfeiffer Big Sur State Park, centered two miles south of Lucia and two miles north of the eastbound Nacimiento-Ferguson Road turnoff.